Green Pepperorns in Brine is a very nifty way to preserve fresh green peppercorns. I captured in my how to video below the way I pickle my green peppercorns. If you love homemade pickles, check out my pickled Jalapenos Recipe! What are Green Peppercorns in brine? Green Peppercorns in brine are pickled fresh green peppercorns that are preserved in a vinegar, water salt brine solution. The green peppercorns are hard and green when freshly harvested, but can’t be kept for too long. After the drupes have been picked, they need to be preserved within 24 hours. Because green pepper is hard to get, I brine the drupes ASAP. The fresh green peppercorn spice turn out soft when brined and are used in various dishes thereafter. One of the most popular and delicious way to enjoy green brined peppercorns is in a creamy steak green pepper sauce. Green Pepper originated in the Western Ghats in Kerala India and was even known to the Ancient Greeks and Romans. Peppercorn is the ultimate spice because it’s part of most cuisines and even made it as a staple spice in western house holds. 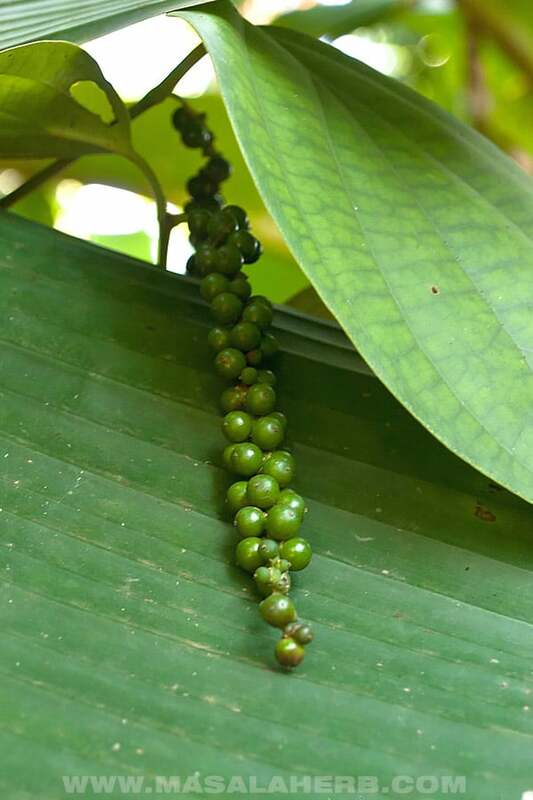 Peppercorns grow on a woody vine in long drupes. The vines are usually planted at the base of palm trees such as coconut and areca palms (bettle nut). That way the vines can grow upwards because they also need shade to grow well. The plant can take 4 years to produce the first peppercorns and will grow peppercorns for up to 8 years after that. Sometimes, peppercorn vines are planted next to Coffee shrubs. It is believed that the end result of the coffee beans will be more aromatic. This is common practice in Goa, Kerala, Karnataka and Tamil Nadu in India. What you might not know is that green black and white pepper come from the same plant. Green Peppercorn is the raw fresh version of a peppercorn. A peppercorn plant will have those growing on them. Black Peppercorn is a dried green peppercorn. 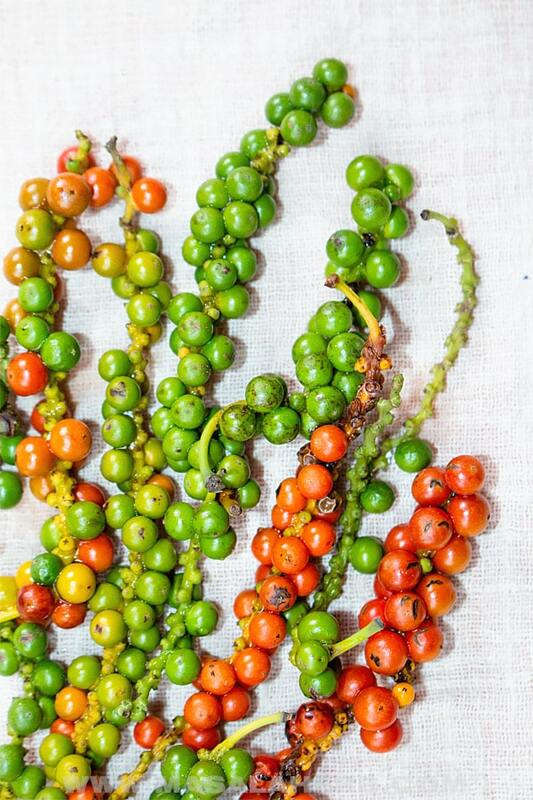 The drying process reduces the fruity aroma of a green peppercorn but adds a pungent flavor to the black peppercorn. White Peppercorns are green peppercorns turned ripe (orange/red) and with the skin removed. The red berries are soaked in water and the skin is rubbed off. Pink Peppercorns are from a different plant species alltogether. They grow on a bush. There are also Wild Peppercorns growing in the Western Ghats in Goa and Kerala but those have become super rare due to mining and deforestation (the area was protected by the national green tribunal and UNESCO). I personally have never seen one. In my opinion, it’s important that you understand the value of Peppercorns. At some point when the medieval period shifted to the renaissance, and international spice trade was blooming, people called (in their ignorance) a whole set of spices peppercorns. This is initially why explorers such as Columbus and Vasco de Gama were commissioned to get into the world. To get spices! Columbus most famously came back from West Indies to Spain with what he thought were valuable peppercorns, just to discover that he had brought back, worthless at the time, Chili Peppers. This is why we keep on confusing the names peppercorns and chili peppers. They really must have thought that they traveled to India when they crossed the Atlantic and docked in America. Peppercorn traders were very wealthy men at the time and enjoying peppercorn spiced food was a luxury reserved to the elite. Where to buy fresh green peppercorn? Getting fresh green peppercorns can be a challenge to be honest. Brined green peppercorn can be bought in supermarkets. I used to buy mine in Aldi until I got some fresh green peppercorns and made my own batch of brined peppercorns. You can buy green peppercorn drupes in an Asian specialty store. Ask the store folks if they can arrange some for you. Or look out for a spice farm in your corner of the world. Peppercorns grow in humid and tropical areas near the equator. Florida for example is a good place to grow green peppercorn. Or during your travels to South Asia, you can try to get green peppercorn and brine them while you are there with vinegar and salt. That’s what I did. I got my green peppercorns from a spice farm in Goa and brined them. I would never go back to buy brined green peppercorn. The quality is better when you make your own. 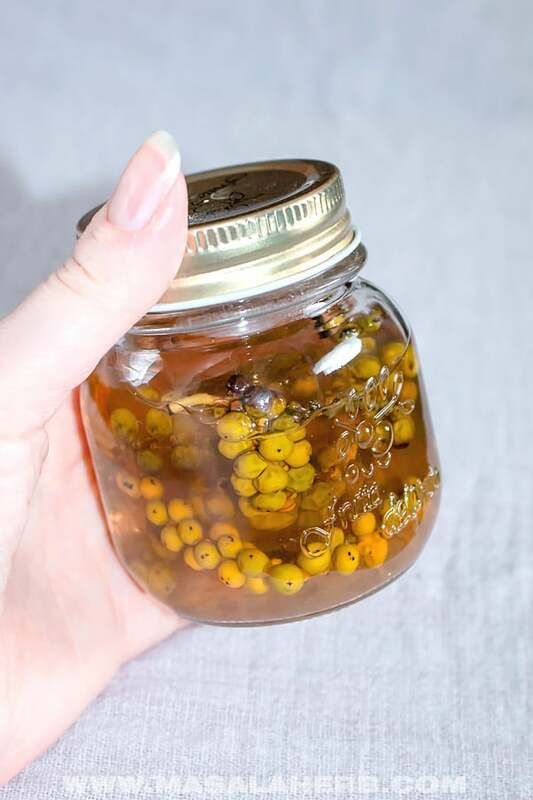 Homemade DIY green Peppercorns preserved in brine. 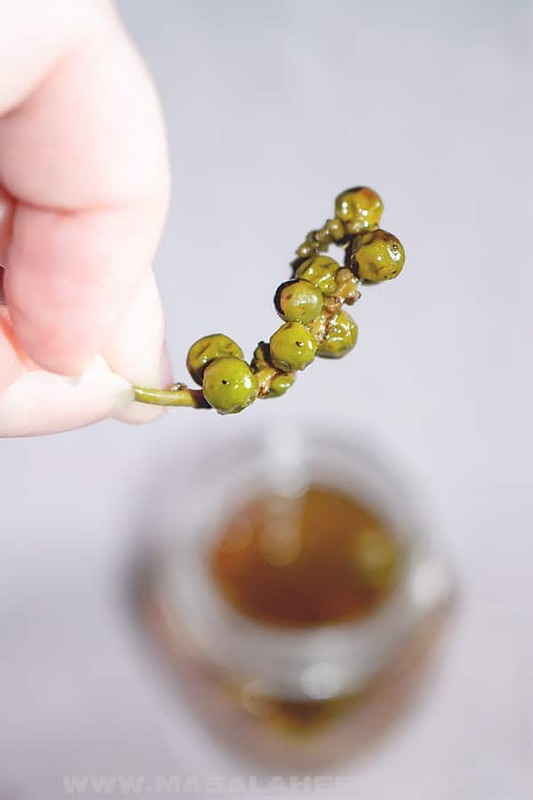 Easy recipe to prepare your own green peppercorn pickle. Rinse your green peppercorns well. I keep mine also in some water with a few drops of vinegar to get rid of insects trapped between the drupes. Keep your jar ready an place the green peppercorn drupes into the jar. The more you can fill up the jar the better. Prepare the brine by heating up a pot with the water, salt and vinegar. Mix it all well and bring to a quick boil. Pour the hot brine over the green peppercorn so that the pepper is covered with the liquid. Close the jar with the lid and keep out for two days. Refrigerate after three days and use in your food whenever you like. Peppercorn drupes vary in sizes. The amount I mentioned is just an approximate indication. 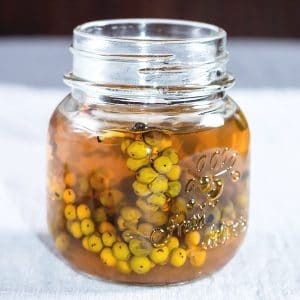 If you can, fill up your jar with peppercorn drupes. If your jar is only half full, that’s ok too. You can always add more green peppercorns later to the jar. This might happen if you grow your own green peppercorn drupes. You can also add the red ripe peppercorns to your jar if you like. The red ones are great when brined too and preserve for a long time as well. 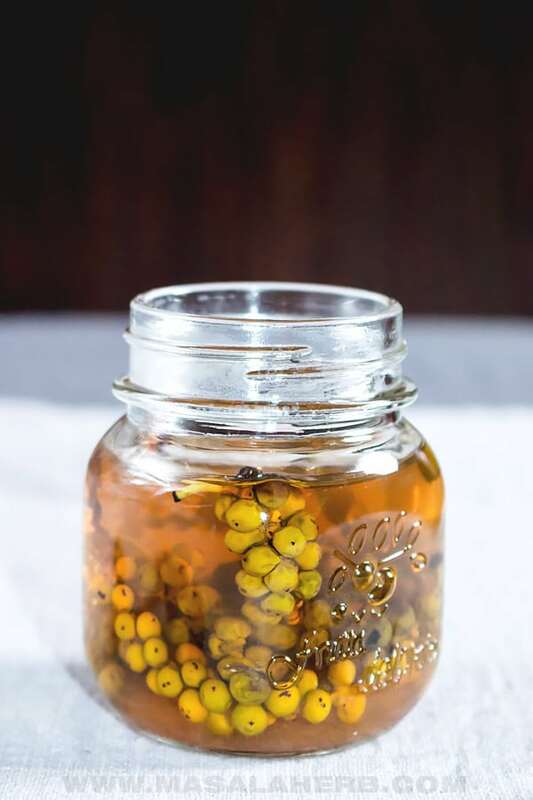 Use only clean sterilized jar to prepare this canned green peppercorn pickle. Brie Cheese with green peppercorn (my favorite!). If you ever want to attempt to make your own brie cheese. Just add some of your pickled green peppercorn to your meals to add flavor. It’s quite a versatile ingredient and can be easily used with other ingredients. Dear Reader, have you seen fresh green peppercorns in your region? Hi, this may be interesting you: Green Peppercorns in Brine!